Germany's federal prosecutor on Tuesday blamed the sole surviving suspect for a string of killings from 2000 to 2007 that left eight Turks, a Greek and a German policewoman dead. Defendant Beate Zschaepe, accused of helping to found a neo-Nazi cell, the National Socialist Underground (NSU), arrives for the continuation of her trial at a courtroom in Munich, Germany July 19, 2017. Germany's federal prosecutor on Tuesday blamed the sole surviving suspect for a string of killings from 2000 to 2007 that left eight Turks, a Greek and a German policewoman dead, in a case that shocked the nation. 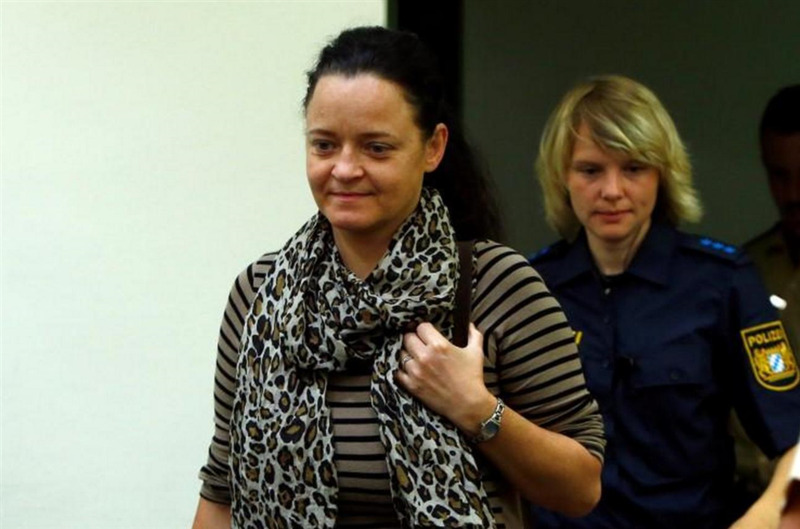 Prosecutors say Beate Zschaepe, 42, was part of the so-called National Socialist Underground (NSU), a neo-Nazi group that carried out the murders as well as two bombings and 15 bank robberies. Zschaepe has denied taking part in the killings with two friends, who killed themselves in 2011 when police discovered the gang by chance. But she has, through her lawyer, said she felt morally guilty for not stopping them. Federal public prosecutor Herbert Diemer said four years of hearing evidence had shown that Zschaepe was a "co-founder, member and accomplice" of a terrorist organisation. The evidence also backed up accusations against four co-defendants, who are suspected accomplices and supporters, he said. Zschaepe listened to Diemer with an expressionless face, her chin resting on her hands. Although the murders were carried out by Zschaepe's two friends, Uwe Mundlos and Uwe Boehnhardt, Zschaepe played a key role behind the scenes, said Anette Greger, senior public prosecutor. "The accused was a key stabilising force in the group," Greger said. Zschaepe was involved in planning and arranged money and alibis, she said. That contradicts Zschaepe's account - she said in December 2015 that she had "nothing to do with the murders", denied being a member of the NSU and said Boehnhardt and Mundlos only told her about the murders after they had committed them. If found guilty, Zschaepe could face life imprisonment. The federal prosecutor is expected to comment in coming days on what sentence he will seek. The trial has been going on for more than four years. The closing arguments by the prosecutors and the defence are expected to take days, so a verdict is likely to come only after the summer break. Zschaepe, Mundlos and Boehnhardt were based in eastern Germany, which saw a surge in right-wing violence after the fall of the Berlin Wall in 1989 and the collapse of the communist state. An investigation released in 2014 said local police had "massively underestimated" the risk of far-right violence and in a "fiasco" of missteps allowed the cell to go undetected for over a decade.